Antioxidative activity of pea bean (Phaseolus vulgaris L.) extract was evaluated by using a linoleic acid system, and the methanol extract exhibited strong antioxidative activity as measured by the thiocyanate method. The crude methanol extract was partitioned between then-butanol phase (BP) and the water phase (WP). Then, the antioxidative activity of the BP and the WP was determined by using a linoleic acid system. The WP showed strong antioxidative activity, while BP showed only weak activity as measured by the thiocyanate method. Next, the synergistic antioxidative action of WP with α-tocopherol was examined by using linoleic acid and liposome systems. 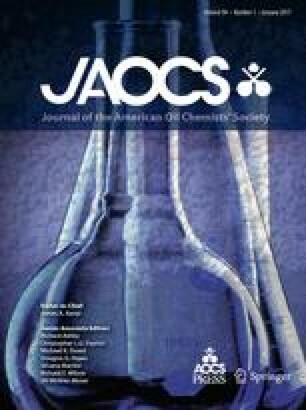 The WP had a synergistic effect with α-tocopherol in both the food model and liposome systems. For purification and isolation of the antioxidative substances of the pea bean, preparative high-performance liquid chromatography was carried out with an octadecylsilyl column. Five fractions were collected, and antioxidative activity was determined in a linoleic acid system. Although fraction 1 had strong activity by the thiocyanate method, the purification of this active fraction was difficult; therefore, the partly characterized active fraction was investigated. The contents of total phenolics and sugars were 0.31±0.01 mg/g of fraction 1 and 406.1±0.1 mg/g, respectively. The ninhydrin chromogenic reaction was positive, and the ultraviolet absorption spectral λ max value in distilled water was 264.0 nm, indicating that the water-soluble antioxidative components from pea bean may be a new type of antioxidant. Isolation and identification are currently being investigated.